Our President, Linda Merrick holds the position of Principal and Professor at the Royal Northern College of Music, and is UK representative for Howarth Clarinets. She has an international profile as a clarinet soloist, recording artist and clinician. Her catalogue of over 20 solo CD recordings includes new concertos by Gary Carpenter, Nigel Clarke, Martin Ellerby, Kit Turnbull and Guy Woolfenden (Polyphonic), Philip Sparke (Anglo Records), Stephen McNeff (Campion), John McLeod (Chandos), Edwin Roxburgh (NMC), and Philip Spratley (Toccata). Linda’s chamber music output includes premiere recordings of four new clarinet quintets with the Navarra Quartet (Naxos), a new clarinet quintet by John McCabe with the Kreutzer Quartet (Guild), Wilfred Joseph’s Clarinet Quintet and Robert Crawford’s Clarinet Quintet (Metier), chamber works by Malcolm Arnold and John Ireland (Maestro), and Martin Ellerby (ClassicPrint), and new works for clarinet and electronics with Chris Thorpe (Voiceprint). Linda has broadcast for BBC Radio 3, Radio France, DRS1 Switzerland, CKWR Canada and Arte TV South Korea, and performed as a concerto soloist across America, Asia, Australia, Europe, South America, the UAE, and throughout the UK. She is a founder member of the contemporary ensemble ‘Sounds Positive’, with whom she has premiered over 70 works by British composers, and released 3 CDs. 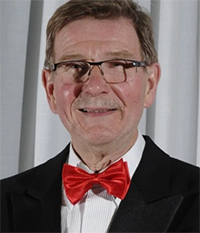 Howard Rogerson became Conductor of Settle Orchestra in 1992 after being asked to guest conduct the Orchestra in a joint performance of Mozart’s ‘The Magic Flute’ with Craven Opera Group. It was during his 15-year tenure that the Orchestra underwent its most significant period of change, growing both in terms of numbers of players and standard of playing. He developed a strong community-orientated focus for the Orchestra and this was maintained through his encouragement of players of all abilities. He also introduced the junior membership scheme, which epitomised his policy of providing opportunities for youngsters to experience orchestral playing. This initiative has ensured that there is always a refreshing mix of ages within the orchestra. During his time with the orchestra, Howard worked in partnership with three leaders, beginning with Anne Heaton in 1992. Kenneth Mitchell took over in 2001, followed by Tracey Keeley in 2002. In their respective fields of wind and strings, conductor and leaders used their professional playing and peripatetic teaching experience to lead frequent sectional rehearsals, helping players improve and develop their skills. Howard’s choice of programmes expanded and improved the orchestra’s repertoire whilst at the same time giving its members the chance to play many different styles of music. Concert programmes ranged from symphonies and concertos to ballet, opera and light music pieces, and only very rarely were any works repeated. Under Howard’s directorship, the orchestra performed well over 300 works in 90 regular concerts and various special events. Several of these were joint concerts with the Langcliffe Singers, including the Verdi Requiem and Mendelssohn’s Elijah. Howard’s 38 years as a professional clarinettist provided the contacts that led to concerto performances with Marat Bisengaliev (violin), Benjamin Frith (piano) and the Gould Trio. He also helped to initiate two very successful day workshops, attended by over 70 musicians from Yorkshire, Lancashire and Cumbria, and a World Premiere of ‘Striding Dales’ by Christopher Beardsley, both events supported by Making Music. On his retirement in 2007, Settle Orchestra awarded Howard the title of Emeritus Conductor, in recognition of his important contribution to the Society and his many years of dedication to its development and success. Howard became the vice-president of Settle Orchestra following the sad death of the previous incumbent, Arthur Butterworth. In 2007, Howard fulfilled his dream of running and conducting a professional seaside orchestra by forming the Promenade Concert Orchestra of Morecambe (PCO). Using his many years of experience, and his own extensive library of light orchestral music, Howard and his orchestra quickly built up a large and faithful following, and they perform regularly to sell-out audiences at their home, The Platform. The enthusiastic response and support for the PCO allows this charming music to be heard again by a wider audience. The PCO season consists of four concerts, each with a different theme, including Palm Court selections, music from the shows and the music of Vienna with its waltzes and polkas. For further information and to book tickets, visit The Platform website, or phone 01524 412552. Tjeerd Barkmeijer is a young Dutch conductor, currently studying for his masters degree at the RNCM with Clark Rundell and Mark Heron. After finishing his undergraduate studies in Music Teaching and Conducting at the Prince Claus Conservatoire in Groningen, Tjeerd gained experience in both orchestral and opera conducting. He has taken part in several international conducting masterclasses and received tuition from well known teachers and conductors as Sir Mark Elder, Nicolás Pasquet, Neil Thomson, Benjamin Zander and Antony Hermus. 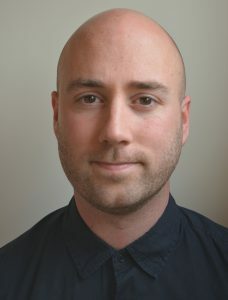 Since studying at the RNCM, Tjeerd conducted many of its ensembles and orchestras and has been assistant conductor with the Hallé, BBC Philharmonic and the Royal Liverpool Philharmonic Orchestra. In May he conducted the Stockport Symphony Orchestra in concert with works of Elgar and Brahms and in June he conducted the Northern Ballet Sinfonia. During the summer he travelled abroad for masterclasses with the Savaria Symphony Orchestra (Hungary) and the Stavanger Symphony Orchestra (Norway). Anne Heaton studied violin and piano at London College of Music, winning many awards and leading all of the College orchestras. She then studied at the National Centre of Orchestral Studies and worked with some of the world’s top conductors including Sir Simon Rattle. After working in Germany for a few years, Anne began teaching in London and soon realised that this was the career she wanted to follow. She has worked for the North Yorkshire County Music Service for over twenty five years and is Assistant Head of the Service. 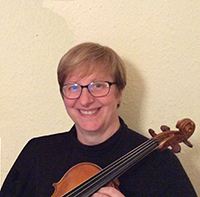 Anne performs regularly throughout the North West and has been leader of the Lancashire Chamber Orchestra since 2004, performing at the Bridgewater Hall, Royal Northern College of Music and The Lowry. She particularly enjoys encouraging young musicians in the Craven area to join their local orchestra.